With 30+ years of experience in the construction industry, our founding team understands what it takes to make a construction project a success. Through document control, accounting, profit control and owner satisfaction, BuildBinder helps you better service your clients with transparency. Take control of your construction process with BuildBinder. BuildBinder’s cloud-based platform puts information at your fingertips, anytime, and anywhere. The system provides a single working methodology for all team members, so that information is available, searchable and ultimately useful at all times. Collaborate with ease, and manage your construction project from end-to-end with neatly organized dashboards. 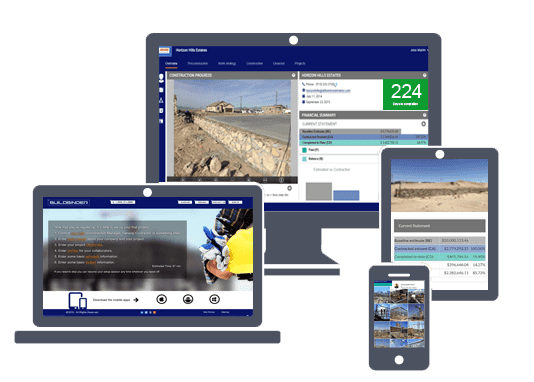 How can BuildBinder help each stakeholder in your construction project? I can manage all my subs with just a glance. I can tell my client exactly what is happening and when. I can accurately predict occupant move-in dates. I can instantly tell if my project is staying within budget. commercial, industrial, infrastructure, residential and agro-industrial projects.